Weary of discouraging news, I headed out to walk by the Bay. A flotilla of common eiders caught and held my attention, several mothers shepherding a dozen or so downy ducklings. The water was iridescent as day slid into dusk, and the eiders – like the water – appeared unruffled. That could change in an instant, I knew. 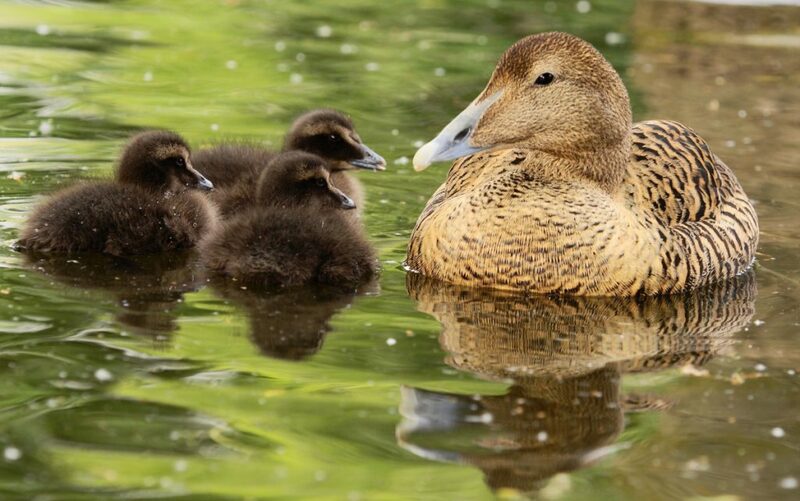 I once witnessed a different crèche of eiders when a great black-backed gull happened by, lifting off an unsuspecting chick before the mothers could corral a once-leisurely line into a secure knot. Seeing predation at work can be unsettling, confronting us with the inescapable truth that life feeds on life. That hard realization is part of what underlies moral systems that assign differing weight to the value of other beings, observes David Livingstone Smith, a philosophy professor at University of New England and author of “Less than Human: Why We Demean, Enslave and Exterminate Others.” In a recent conversation, he explained the human tendency to “modestly place” our own kind at the pinnacle of a moral ranking, assigning highest value to those of our own species, race, religion or ideology and successively less value to others. Now the United States, once held up as a beacon of democracy, has a president wielding this degrading language like a blunt instrument, eager to inflame racial tensions for what he perceives as political gain. As dangerous and offensive as his epithets are, it’s important to see the Twitter taunts as evidence of a larger, more entrenched problem: the all-too-human hubris that exacerbates countless societal and environmental problems. Our species’ conviction of superiority places “lesser” species and the physical world literally “at our disposal,” creating a world of throwaway people and resources. It lets us discount destruction wrought downstream – whether that harm occurs in local waters, to distant workers or to generations not yet born. American exceptionalism is a dangerous myth to hold, Smith cautions. It prevents us from acknowledging – and teaching – about historical atrocities this country’s citizens have perpetrated. And it makes it harder to face up to real-time atrocities as they happen. Confronted with widespread abuse of refugee families in search of asylum, Americans are prone to repeat “we are better than this.” That deflection just digs us deeper into denial. Clearly, we are not better than this – whether “this” represents the caging of children, the gutting of environmental protections or the willful neglect of our Constitution. We won’t get better, or more aptly be better, until we acknowledge how damaging a hierarchical mindset is – to fellow humans (victims of racism, sexism and other oppression) and to the beleaguered natural world. There’s evidence aplenty of this damage, even in a nation once known for high ideals and in a state legendary for its “unspoiled” environment. MARINA SCHAUFFLER is a freelance journalist and editor whose work is online at www.naturalchoices.com.